Just wanted to say a big thank you for the work you did for our dog Tess over many years. She first came to you aged 7 with cruciate ligament tears in both knees. Your laser acupuncture fixed that, and again a couple of years later. We moved to Melbourne four years ago and were lucky to find a vet here who does acupuncture but her laser wasn’t as effective as yours. I feel that you gave us many more years with Tess than we would have had. We had to have her put to sleep a couple of weeks ago at 15 years and 3 months. 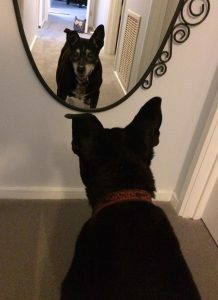 The photo below is a picture taken just a couple of weeks beforehand, we’d put a mirror at the end of a passage and she was fascinated with her reflection.